When it comes to Ken Robinson everybody knows that he has done very much in the field of education and education innovation. His public speakings on TED are widely famous and he always seems to give a healthy insight on what education really means, on what’s wrong with the system all over the world and what we can do to change it! I really like the way he speaks, his serious debates are always filled in with funny personal quotes and his writing is just the same. 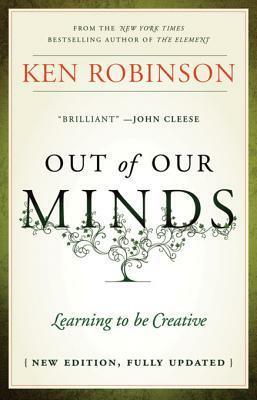 I read Out of our minds last year as a recommended book for one of the courses I’ve attended and I really liked it. Its main idea is that we should put more emphasis on creativity at school and that arts are equally important to students as maths and sciences are! And I truly think it so myself, even if I’m not an Art teacher. Problem is, that Music, Art and even Sport are not considered subjects worthy of great attention and often schools lack qualified teachers for those subjects or the numbers of classes per week has been shifted to the minimum they could afford. Increase on math and sciences is not the real solution. It goes the same for modern languages. Learning a modern language without reading and discovering literature is not the best solution either. In a world where lifelong employment in the same job is a thing of the past, creativity is not a luxury. It is essential for personal security and fulfillment. The dominant forms of education actively stifle the conditions that are essential to creative development. Young children enter pre-school alive with creative confidence; by the time they leave high school many have lost that confidence entirely. It is important to understand why and how this happens. As we grow up, education is meant to guide us from childhood to maturity. It should be high among the ways in which we realize our creative abilities. More often it is why we lose sight of them. Thinking of education as a preparation for something that happens later can overlook the fact that the first sixteen or eighteen years of a person’s life are not a rehearsal. Young people are living their lives now. Educating people entirely through the left-brain activities of the academic curriculum was, he said, like training somebody for a race by exercising only one leg while leaving the muscles of the other leg to atrophy. My premise is that we are all born with immense natural talents but that too few people discover what they are and even fewer develop them properly. Ironically one of the main reasons for this massive waste of talent is the very process that is meant to develop it: education. Mathematics is the best medium for some forms of understanding but relatively poor for others. If you want to describe the movement of electrons, you need algebra. If you want to express your love for someone you could use poetry. If someone asks you, „How much you love me?” don’t give them a calculator and say, „Here, you work it out!”. In all creative processes we are pushing the boundaries of what we know now, to explore new posibilities; we are drawing on the skills we have now, often stretching and evolving them as the work demands. If you have kids or if you work as an educator yourself, this book is a must! I strongly recommend it!